Operating out of Cádiz in Spain’s south Macco Motors builds an enormous number of custom bikes each year that are shipped all over the world. 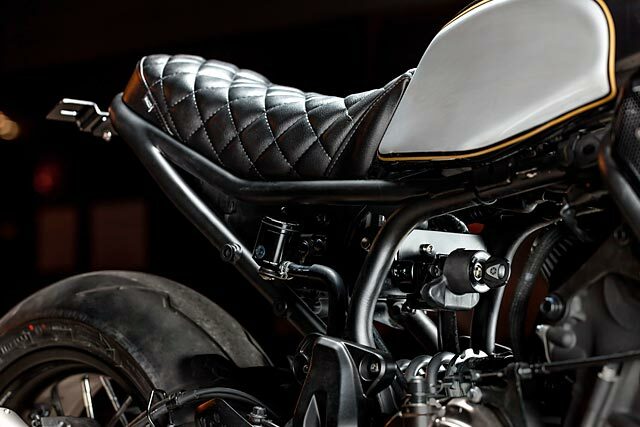 For a period of time it seemed every second custom Bonneville we laid our eyes on had come from their workshop. And liking what he saw Alberto thought he’d join the Triumph fraternity and got in touch with Jose. 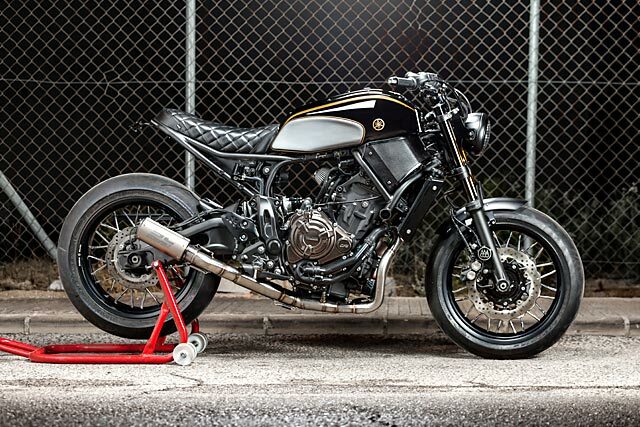 But he soon changed his mind having seen Macco’s Yamaha ‘The Kraken’ and headed to his nearest dealer and threw down the cash for the XSR700 in Yamaha’s 60th anniversary colour scheme that was on the showroom floor. Sitting down with the Macco team Alberto started to list the things he wanted modified on the bike, as Jose tells us “basically everything” and oh, he was on a tight budget. 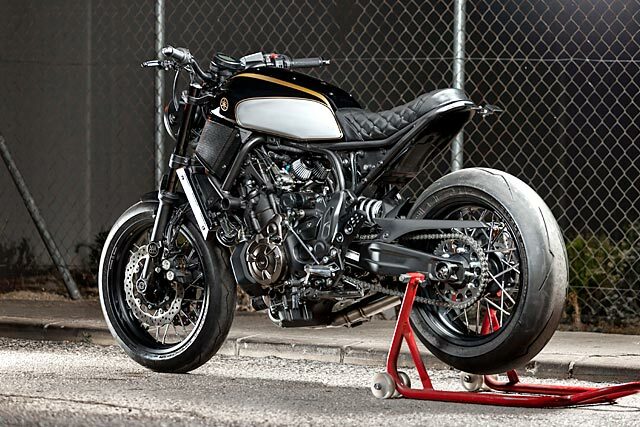 With near on a dozen other projects in the works needing to be shipped out around the world most custom builders would have freaked, but totally unphased Macco tallied up the requirements and got to work. 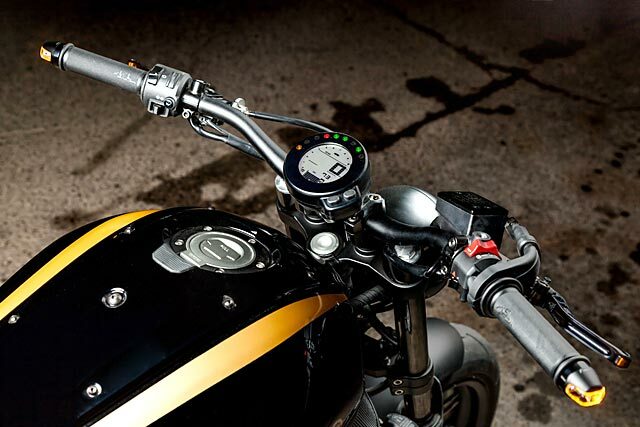 “With this concept we worked on a Photoshop design and got it right in the first attempt.” With Alberto happy and signing off on the drawings the XSR was allocated a work station and the strip down process could begin. 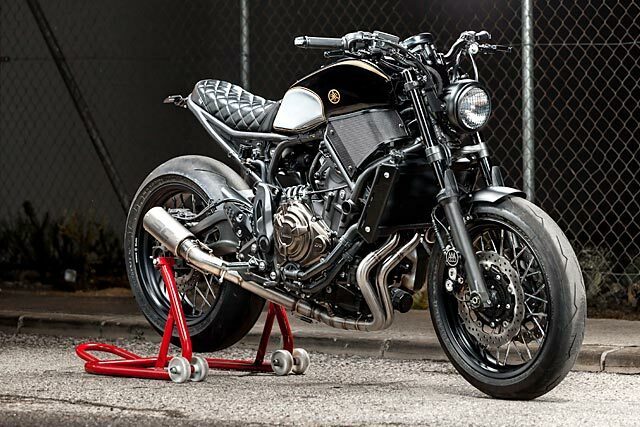 One of the downfalls to the look of the MT/XSR range is the steel diamond frame, which like a twin spar item can make modifications more difficult than working with an old school single backbone chassis. But rather than do anything drastic and with a limited budget the decision was made to tidy up what was already there. That begins with the rear subframe that is heavily cut back before a new hoop was seamlessly welded into the main frame. A recess has been cut to allow the taillight to be frenched in before the whole frame was resprayed to factory specs. One of the aims of the build was to reduce weight and removing the airbox and much of the central mass was seen as the way forward and would differentiate the build from ‘The Kraken’. With all the plastics removed the negative space behind the engine would stay but the forward cover area needed a solution. 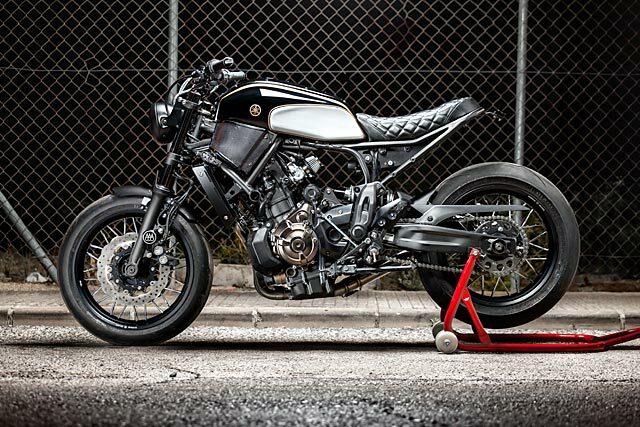 “Probably the hardest part of the bike was the side panels. When we started we didn’t know exactly how it will work with that grilled plate and the frame, but in the end we got a good look,” explains Jose. The make everything minimal look was continued throughout the rest of the cosmetic side of the build with the factory front fender tossed aside for a Rizoma anodised item. While even the headlight got the downsizing treatment to a 6in unit that is mounted hard up against the trees on new supports. This meant the ignition had to be relocated and finds a home under the seat. While the top triple tree was machined to allow the stock speedo to be mounted over the risers for a far cleaner finish. Those risers come from LSL who also supplied the new beefier bars in a matching black. These wear grips from LSL and while they were raiding the catalogue they also grabbed a set of LSL adjustable levers. With a set of bar end indicators from Rizoma the front end was finished off and it’s remarkable just how much a few well thought out mods clean up the clunky stock front end. 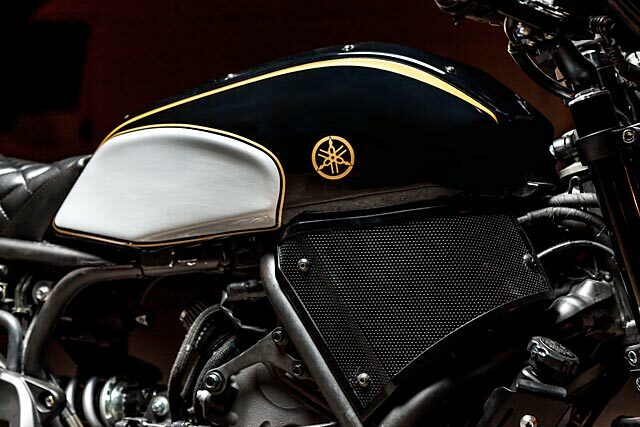 But to add some pop to the party the boys laid down a paint scheme of Alberto’s choosing; a brilliant mix of black and gold, with raw alloy knee dents to show off the aggressive lines of the factory tank. The parallel twin cylinder Yamaha engine has driven a nail into the coffin of the claims that modern incarnation of the platform is for boring commuter bikes only. 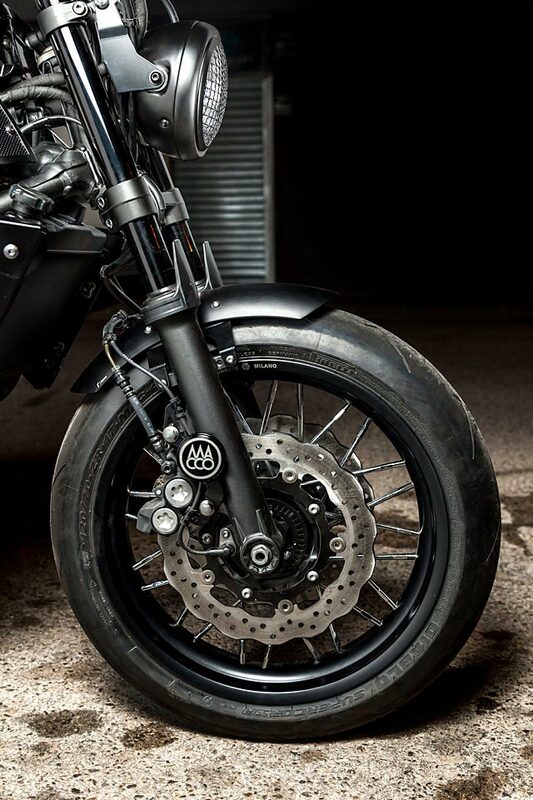 The crossplane philosophy design means there’s torque at any rpm and it’s always just whispering in your ear to rev it a little more. 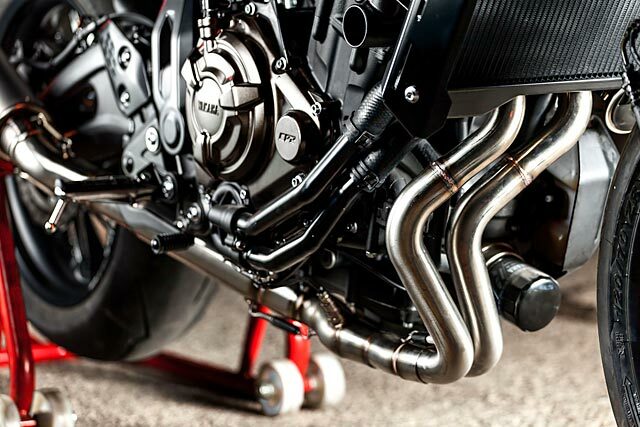 But that whisper is now a howl as Alberto wanted his XSR to scream. So Macco built the perfect combination of MT Arrow headers neatly mounted up to an SC Project CRT end can for that GP starting grid sound. The induction is only mildly less aurally explosive with the entire airbox replaced with two pod filters. To put the power down and make the most of the flickable factory handling a set of Pirelli Diablo Supercorsa tyres were fitted up. But not to the standard wheels as a switch to spoked items was another of Alberto’s special requests. To get the job done Macco selected a set of special Borrani wheels that feature cold machined aluminium rims and cnc billet centre hubs. 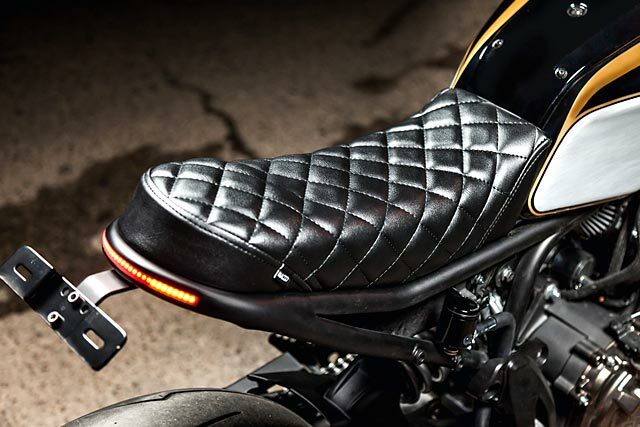 Finished in black they match the design brilliantly and with a Macco diamond stitched seat designed and fabricated Dusky Devil was ready for delivery. But as Alberto disappears into the sunset there is no rest for Jose and Tito with bikes to be built for customers on three different continents; it’s all in a day work at one of the world’s most successful custom shops.